Learn how Silicon Valley’s most exciting startups come up with their ideas and how they turn those ideas into reality. Anyone who has taken a shower has had an idea, but how do you turn those ideas into reality? Netflix Founder and startup CEO Marc Randolph will share dozens of tips, tricks and stories drawn from his 4 decades as an entrepreneur that will help you more easily come up with innovative ideas, validate them, and get your new venture off the ground. Equal parts inspiration, start up stories, and practical tips, it’s a message that resonates equally well with students, early stage entrepreneurs, and any businessperson looking to bring innovation to their business. You’ll laugh, you’ll cry, you’ll wonder who the hell writes these keynote summaries! What Silicon Valley has to teach us about innovation. The world is changing rapidly - and companies that can’t innovate effectively are going to be left behind. But while innovation is easy to aspire to, it’s hard to do. Netflix founder and startup CEO Marc Randolph will share dozens of effective tips, tricks and stories drawn from his 4 decades as an entrepreneur that will help you make your company more responsive to changing conditions - regardless of your company's size or industry. Netflixed: how a scrappy Silicon Valley startup brought down Blockbuster and built one of the world’s best known brands. Marc was co-founder of the online movie and television streaming service Netflix, serving as their founding CEO, as the executive producer of their web site, and as a member of their board of directors. 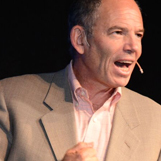 Marc Randolph is a veteran Silicon Valley entrepreneur, advisor, investor and keynote speaker. Marc was co-founder of the online movie and television streaming service Netflix, serving as their founding CEO, as the executive producer of their web site, and as a member of their board of directors until his retirement in 2004. Although best known for starting Netflix, Marc’s career as an entrepreneur spans more than four decades. He’s been a founder of more than half a dozen other successful start-ups, a mentor to hundreds of early stage entrepreneurs, and an investor in numerous successful (and an even larger number of unsuccessful) tech ventures. Why Marc Randolph? Marc Randolph is a veteran Silicon Valley entrepreneur, advisor and investor perhaps best known as the co-founder of Netflix. His message is a blend of inspiration (overcoming adversity / anyone can do it / etc. ), stories drawn from the starting and growing of Netflix, plus dozens of concrete suggestions taken from his 4 decades as an entrepreneur on how people can bring innovation back to THEIR companies. Most recently, Randolph co-founded an analytics software company Looker Data Sciences, and currently serves as an advisor to numerous other startups, serving variously as a mentor, CEO coach, and/or board member. He is a frequent speaker at industry events, works extensively with young entrepreneur programs, and is a trustee of the non-profit National Outdoor Leadership School. Marc Randolph is charming, handsome and modest; and whenever possible avoids referring to himself in the third person. He lives in Santa Cruz, California.